I hope you will take some time today to be informed by clicking through to read this week's cover article in TIME Magazine, Dropout Nation, because there are some issues that we, as members of our community, can in fact step up and make a difference with. Each and every one of us has something pulling at us to give that would make a difference. I'm inviting you to get informed, and get in touch with whatever comes into your consciousness as you read this article and consider ways you can make a difference. The Bill & Melinda Gates Foundation has trained its moneyed eye on the problem, funding "The Silent Epidemic," a study issued in March that has gained widespread attention both in Washington and in statehouses around the country. The attention comes against a backdrop of rising peril for dropouts. If their grandparents' generation could find a blue-collar niche and prosper, the latest group is immediately relegated to the most punishing sector of the economy, where whatever low-wage jobs haven't yet moved overseas are increasingly filled by even lower-wage immigrants. Dropping out of high school today is to your societal health what smoking is to your physical health, an indicator of a host of poor outcomes to follow, from low lifetime earnings to high incarceration rates to a high likelihood that your children will drop out of high school and start the cycle anew. Identifying the problem is just the first step. The next moves are being made by towns like Shelbyville, where a loose coalition of community leaders and school administrators have, for the first time, placed dropout prevention at the top of the agenda. Now they are gamely trying to identify why kids are leaving and looking for ways to reverse the tide. 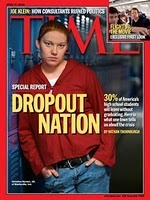 Click here to read entire Dropout Nation article. As you know, we create inspirational movies to teach and inspire us all to be our best selves. We are entering the spring season which brings Recognition Award Banquets, Special Acknowledgment Days (Birthdays, Anniversaries, Mother and Father Days) and Graduations. It is our hope that you will invest in honoring individuals this year with Blue Ribbons. One of the movies we've done is about how a Blue Ribbon Ceremony and the actions of one teacher dramatically altered the life a business man and his 14-year old son. If you've never acknowledged someone with a "Who I Am Makes A Difference" Blue Ribbon or "I Make A Difference" Wristband to let people know just how much they matter in this world, you are truly missing a profound experience. It's not just you who is missing out, the people in your life are missing your heart connecting, uplifting acknowledgment of them. Something to think about: I hope you will join us - along with Helice Bridges the creator of the Blue Ribbon Ceremony - in her goal that every person in the world receive a Blue Ribbon in her lifetime. Click here for Blue Ribbons and / or Purple Wristbands with simple 10-Step Ceremony.